Can such an offer backfire on the Golden Knights? I mean who wants a successful college football program, when you get all the free beer you want because of their struggles. According to TMZ Sports, a sports bar near the Central Florida campus called The Basement Orlando is offering free beer during this weekends game against Tulane. With UCF currently winless, the bars head of marketing, Jake Whitcare says they thought this would boost fan morale. 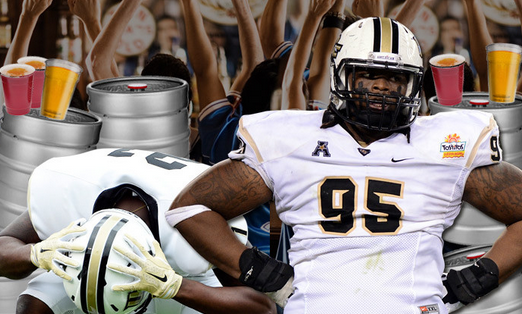 Whitcare tells us, they’ll be serving up domestic kegs totally gratis until the UCF Knights win a game. He says they’re in this for the long haul — as in 0-12, if it comes to that. Here’s the thing … we have no doubt the giveaway will boost morale TO DRINK! We’re just not sure how it encourages fans to cheer for a win. Again, if I’m a partime fan or the bandwagon type, I’m naturally cheering on Tulane, right?